During this holiday season, you will give and receive many gifts. This year, why not give a gift that has the ability to make a difference and share the love of Christ with others? Your financial, in-kind, and volunteer gifts this season can transform the lives of those in need this holiday season and year-round. On the first weekend of December every year, Manchester UMC makes a difference in the lives of those in need through our annual Gifts in White weekend. In 2018, 2,480 gifts were collected! Thank you for your support. 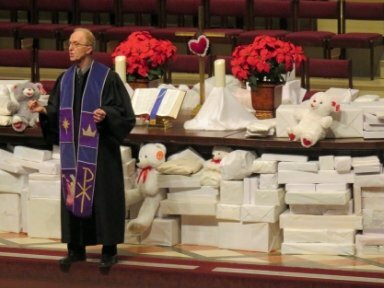 At all services, members and friends are invited to bring gifts (new items only, please) wrapped in plain white paper to benefit those in need. Mark your gifts: E=Epworth; K=Kingdom House; BH=Bridge Bread/HomeFirst. Financial contributions accepted online, or write ‘Gifts in White’ in the memo line of your check. If you have any questions or would like to volunteer, contact Laurie Hopkins. For over 150 years, Epworth Children and Family Services has been committed to keeping families together, preventing abuse and neglect, and encouraging self-sufficiency in St. Louis youth and families. Epworth’s services provide a continuum of care for more than 10,000 individuals annually that builds on their individual strengths, helping them to live successfully in the community. Click to learn more. Sports items, basketballs, footballs, etc. HomeFirst STL is an all-volunteer non-profit founded in 2011 by a group of people with a common goal: breaking the cycle of poverty and homelessness in St. Louis. We buy fixeruppers and make them beautiful with the help of volunteer labor. Then we find St. Louisans without permanent housing who are ready to make a change in their lives. People move directly into a safe environment of their own that they can afford, allowing them to climb out of the pit of homelessness. To learn more, visit www.homefirststl.org. Bridge Bread is a social enterprise designed to provide job opportunities for people experiencing homelessness, or those who are housing insecure. The goal of the program is to help the disadvantaged engage in a financially rewarding effort that enhances self-worth, promotes dignity, and enables them to help themselves. For more information, visit www.bridgebread.org. For over 50 years, Kingdom House has celebrated the spirit of the holiday season through its Christmas Shop. Serving hundreds of our participants each year, the Shop provides carefully curated new household and clothing items, as well as age appropriate toys. Our aim is to strengthen families while connecting them with the generosity of its donors. Now called the Holiday Market, the shop will be inclusive of all participants we serve. (Donations accepted year-round).